Wits University’s ladies basketball have won the annual Ashraf Lodewyk memorial basketball tournament for the first time in the tournament’s 14-year history. The competition involving 42 teams took place at the Wits main campus in Braamfontein from April 23 to 29. 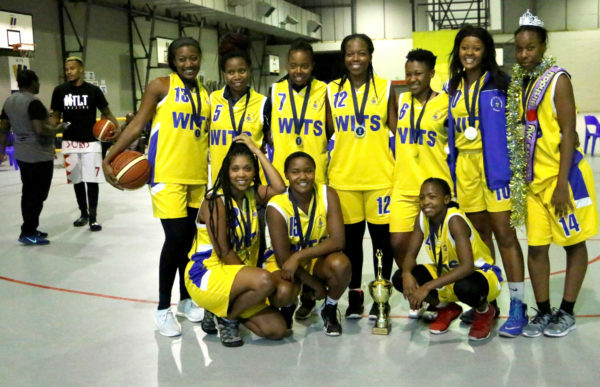 The Wits Lady Bucks, one of four Wits teams, won the tournament by defeating The Phoenix Flames 69-66, becoming the first Wits team to win the homegrown competition. The Rising Suns won the men’s tournament against Vaal University of Technology (VUT), with a final score of 69-60. Willie Matlakala, head coach of the Lady Bucks, told Wits Vuvuzela, that the team has been keen for this win as the hosts of the tournament. “We’ve been wanting to win this tournament for a long time … We wake up in the morning and sleep late at night in the evenings. We never get time to rest. But for us to go and achieve this, I think it shows that the team has got character and they really work hard,” he said. Matlakala added that the team did well despite the lack of players due to injury. “We only had eight players to play the whole tournament, so for them to play like that in the final, shows that they came a long way and I am just so proud of the effort they put in on the court,” he said. The Wits Lady Bucks with their gold medals after their historic win at the Ashraf Lodewyk tournament at Wits. Photo: Nokuthula Mabena. He described the Wits Lady Bucks as a “running team”, which they capitalised on in the competition. Rudo Maseke, chairperson and Lady Bucks player, said winning the tournament felt great. “Phoenix has been the tough team for us this year. We’ve won once, and they’ve won once as well when playing each other. So today to win and it’s the final, it’s pretty great,” Maseke said. Lady Bucks captain, Modiegi Mokoka, said the Ashraf tournament fast becoming a critical precursor to nationals. “We’ve got more universities filling in, initially it used to be predominantly provincial clubs coming into play, but now universities are taking it as an opportunity to prepare for nationals. Quality was good, there were a lot of young people, young faces so it was decent basketball,” Mokoka said. Politeness Makwelantle, one of the injured Bucks players, said despite her lack of involvement, she was still excited about the results. The tournament is held annually in memory of Wits basketball player and administrator Ashraf Lodewyk who died in a car accident in 2004.